Aaron and I are financially successful. We have both worked hard, spent long hours at work and are constantly working to better ourselves and be more successful. I’m proud of what I’ve accomplished in my life and what my financial success will mean for my future. I shouldn’t allow myself to feel ashamed because of the decisions I’ve made in my life that have led me to this point. I’m lucky enough to have a group of friends that are also financially successful. They say you are a reflection of the people that you surround yourself with. If so I’m going to end up being even more successful in my life. I’ve got multiple friends who have paid off homes and who live completely debt free. I’ve got even more friends who are budgeting with that specific goal in mind. All of them are hard-working people who are sacrificing to make their financial dreams happen. Do they deserve to be shamed for being successful – no. Do some of them have that potential? Yes. I’m proud of my friends and what they have accomplished and hope that as I continue to work hard and make wise financial decisions I’ll be in the same position. So what is it that causes us to be ashamed of our success? I thought a lot about this concept recently and realized that for me, most of it is tied in with a desire not to act like I’m better than others. I just don’t want to appear cocky or make others feel bad about themselves. Both are valid reasons for keeping quiet. I don’t want to discount the need for discretion when sharing financial success. You aren’t sharing with the right mindset if you rubbing your success in other people’s faces. There is nothing worse than that friend who constantly overshares their financial success. You know the one I’m talking about. They are constantly bragging and do it with an air of smug superiority. That isn’t the type of monetary success I’m talking about. However, since starting this blog I’ve made a very important realization. By sharing my successes, I’m helping to motivate other people to accomplish their goals. There is nothing more motivating than hearing about the successes of other ordinary people. I’m an ordinary person. Yes, we make good money, but we work really hard. Our success has come over years and years of living within our means, paying down our debt and building an emergency fund. We didn’t take shortcuts to our success. I love talking to friends who have paid off their homes. It gives me that little bit of extra oomph I need when budgeting and saving are getting me down. I know from talking to friends that my experience paying off 293,000 in debt has made an impact on their lives. I’ve lost count of the people I’ve spoken with since writing about our experience. I’ve talked to multiple people who began their debt free journey after reading my post. You can read about how to begin your debt free journey here. I’ll never know the full impact my decision to share our story has had. What I do know is that my decision to share has positively impacted many people. Is this bragging? Maybe it is, but I don’t care. I’m so glad that our story has helped to impact and change people’s behavior. So again I go back to the question why are we ashamed to share our success? I don’t think there is any right answer and everyone has their own reasons. What I want is to encourage people as they work towards their financial goals to share the experiences, both positive and negative. The support that comes from others is invaluable in helping each one of us lift and inspire ourselves and those around us. Don’t give up! Someday I want to hear about how you are making good money too! How to Identify and Avoid Personal Triggers that Lead to Overspending – Living within your means is the best way to manage your money. Self-control really is the key to happiness. Rich Habits: The Daily Success Habits of Wealthy Individuals – Little daily habits have a huge impact on all aspects of our lives. Check out some of the habits that will change the way our manage your day. Love the post. You should be proud of your successes and hold your head up when speaking about them because just as you said – you did not cut corners. A lot of people stand to learn and improve their own situation by knowing what you’ve done. I think that is a really great opportunity if the other person is open to it. I’m glad you enjoyed the post. It took me a while to get to this point, but now that I’m here I’ve discovered it is so freeing. 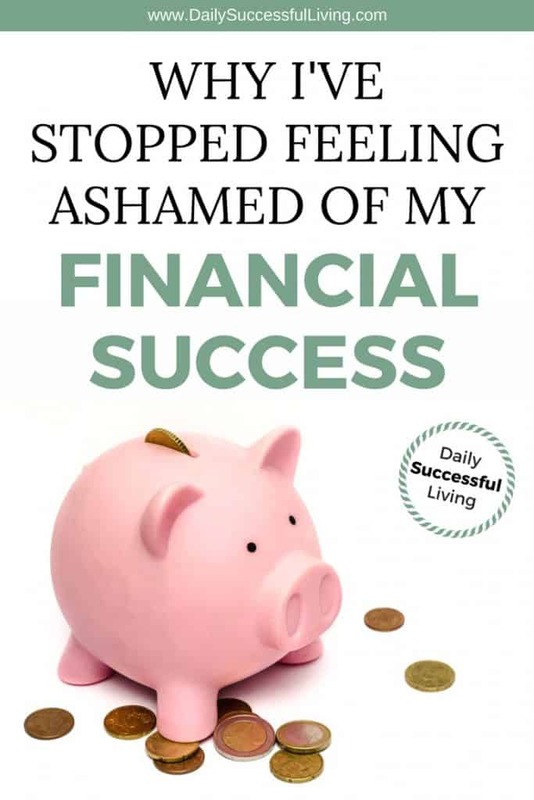 I’ve noticed too that as I’ve shared my story, more people listen and begin to change their financial habits. There is nothing more amazing than being able to help others. Never be ashamed of anything good. You & your husband have done some amazing things; anyone who hates on that has a problem. Proud of you! Thanks! That really means a lot coming from you Mitch! Why? One of the problems I have noticed is people tend to see the results and not the path. I know people who make 50,000 in dividends annually. Where they lucky? Answer is No. They worked hard for it. I will work hard to get there. The feeling of shame comes because others don’t see the sacrifices you made. Never let that drag you down. You totally nailed it. So often people see the end result and don’t take the time to see the hard work and sacrifice that has gone into the success. It takes a lot of work to make those type of dividend so I know you get it! Money is often a very taboo subject. There is always a concern about creating envy/jealously in a circle of friends if there are different levels of wealth amongst them. It is a remarkable feeling becoming debt free when I paid off my mortgage, yet I told no one except for my partner at work. I did describe it on my blog but as I am anonymous (except to a select few) I think it is not quite the same as telling your close friends about it. But becoming debt free and setting an example for others to do the same is important. Everyone loves examples of how it can be done so that was why I felt it was worthy to describe it in my blog. You are my hero! Congratulations on paying off your home. That is next on my list. It is hard to balance the line between jealousy and helping others with your positive stories. That is why we blog – it is all about helping others!